Third grade student Abiana Flores and her family work on their family boat. NETZABERG, Germany — Imagine packing science, technology, engineering, art and math all in a single 2-hour event. 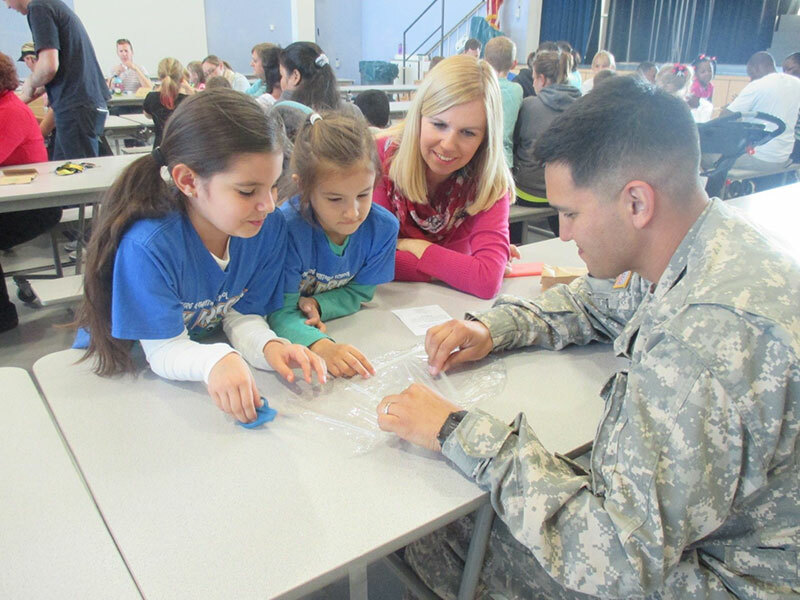 Well, that’s just what Netzaberg Elementary School did Oct. 2 during STEAM night with 100 families and teachers. The event, which will occur several times this school year, encourages families to build and test a mystery item from a brown paper sack. This time that item was a boat, using 12″ scotch tape, 3 straws and 12″ plastic wrap. Once constructed, each family boat was put to the test to see how many pennies it could hold before sinking. The winning boat held 56 coins, and was engineered and built by Jayda Valentine, a 1st grader, and her family. Second place was taken by Logan Riggan, a 2nd grader, with 49 coins. Families were limited to 20 minutes to construct their watercraft. Afterward, they rotated between 9 STEAM stations focusing on art, physics, division, probability and more. And to nourish all that creative brainpower, the NES Booster Club provided snacks and drinks to round the evening out. STEAM stands for Science, Technology, Engineering, Arts, Mathematics. Curious about the next STEAM night? Join NES again in January its second STEAM event. All student participants must be accompanied by an adult, and reservations are necessary to prepare supplies.